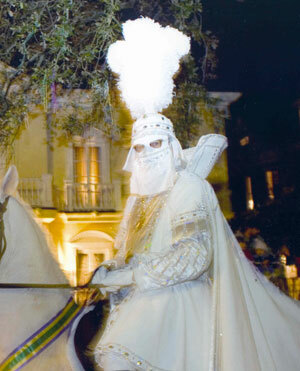 Greetings and welcome to the website of the Mystic Krewe of Hermes! Founded in 1937, Hermes has paraded longer than any other night parading krewe in New Orleans’ Carnival. Held every year at 6:00 p.m. the Friday before Shrove Tuesday, our next parade rolls on Friday, February 13, 2015. I encourage you to be in the crowd to witness what promises to be another visually stunning procession. In the early days, float creation emphasized craftsmanship, detail and story, and Hermes is known for upholding these ideals. As you read this, the Hermes dens are buzzing with the sounds of artists and builders hard at work on the coming show. Recognizing their dedication and vision, Gambit Weekly’s venerated Carnival critic, Rex Duke, has awarded Hermes with Best Night Parade and Best Overall Parade in 2007, 2008, 2011 and 2012! Hermes is also known for an unusual and longtime tradition, the Walking Parade, held earlier that Friday in the French Quarter. After lunch with friends and fellow float riders, the members, dressed in suits and krewe ties and laden with beads to throw, spill from various restaurants and gather on Royal and St. Louis Streets. High school marching bands thunder to life and lead the procession through the Quarter on its way to dress for the night parade. The float parade is the culmination of a season of events which intensify on the final week. The night before the parade is the Hermes Grand Ball, where the King and His Court are presented in an elaborate ceremony, followed by a boisterous Supper Dance. And while the King is the center attraction, his identity is kept secret in keeping with tradition. Please join in our Friday festivities, the details of which you’ll find in this site. In the spirit of the messenger god, Hermes, who descends from Olympus to bring the finest entertainment to this beloved city, I beckon you to “Come In!” and follow me on my white horse into the world of Hermes.